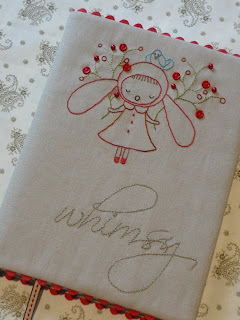 I stitched this whimsical girly some time ago and she has been sitting patiently waiting for me to make her up into a journal cover. 'At last', she declares! I have used my previous journal cover tutorial again for basic dimensions. 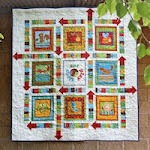 The stitchery design comes from the lovely Elsa Mora blog, as a free pattern here. Of course, you can use any stitchery design you desire to come up with a similar result. 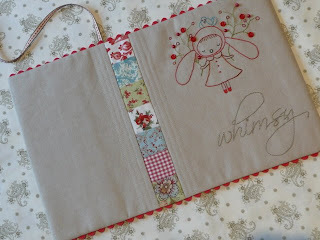 I have had some great comments from several girls who have made up journal covers from my tutorial. I will be back soon to showcase some of their fantastic interpretations. Bloom, she really is a pretty little girlie journal. Very sweet...the kind of journal to write all things lovely and all things serene! This is really adorable. I love journals and I would love to keep notes in this one. Thanks for sharing! This cover is really pretty and lovely! I love it lots! Thank you for sharing! Have a lovely merry happy day and love to you! It's just adorable, really lovely. Thank you for the tutorial. I had kept the stitchery design some time ago and I love what you've done with it. It has just the right look with the strips, ribbon and ricrac. Who doesn't like ric rac. I think I'll make this for a secret santa gift! That looks fantastic , you have inspired me to make some more. Oh Ros, it's just gorgeous and thanks for the link. I'll use that for sure. Love your photography. always looks so professional. That is really, really cute!! It is sooooo cute. I really have to make some journal covers. But first some other serious sewing this weekend. OH.!! I Love this one..it is too Cute..the red ric rac really adds to it...Good One.!! 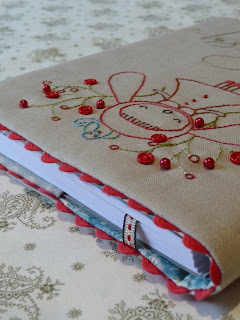 Love the stitchery and the linen journal cover! What a sweet journal cover! Love the stitchery, the patchwork, the linen, the ricrac - does it get any better? What lovely neat work you do. This is really pretty. 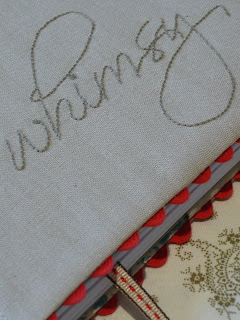 I also love the grey/white fabric you have underneath the journal. It's gorgeous. I really enjoy reading your blogs and seeing what you are creating next. Ros, where do you buy your linen from, I have had trouble finding some here. So sweet! 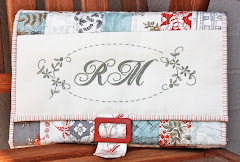 And thanks for the reminder about your journal cover tutorial! I wanted to make it when I first saw it, then got so busy.....Now it's at the top of my list again! How sweet...what a wonderful variation! 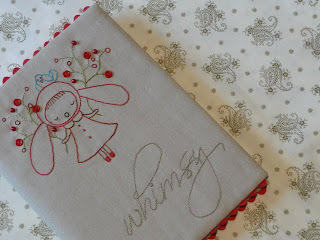 Another cute journal cover! 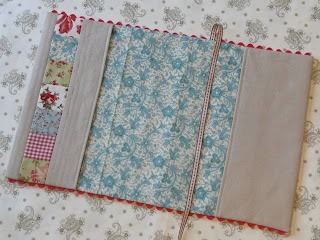 Love the rick rack around the edges and the stitchery is adorable. Your work looks great as usual. wow - that is so beautiful! What will you use it for? This is just utterly adorable! The stitching is georgous, and all the detail. I love the little patchwork strip. Very nice! love the ric rac. I'm getting ready to make some of these for my first craft show, but they won't be half as cute as yours. I love it! These would make such wonderful gifts. that is so very pretty! 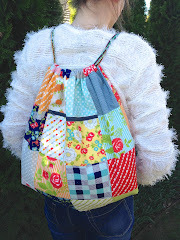 And your patchwork stripe down the back is the perfect touch. I've not been inpsired to make a journal cover before - I am now! What a great journal cover! It made me start thinking on making a cover for books I'm reading, just to protect them when I'm are carrying them around! I love all of it, especially the little birdie on her head. So pretty and dear. Every part of this is beautiful! What a lovely combination. 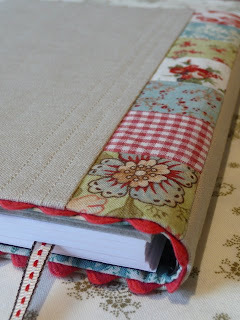 I love your book cover, I am wondering what you used for the cream fabric that you stitched on. It looks really nice. I just love the rick rack peeking out! It is lovely, theres is a lovely combination.